Purpose: Use this document as a reference for reporting time using a timesheet in ctcLink. Change the date to the appropriate time period. Click the Refresh button to update the date. 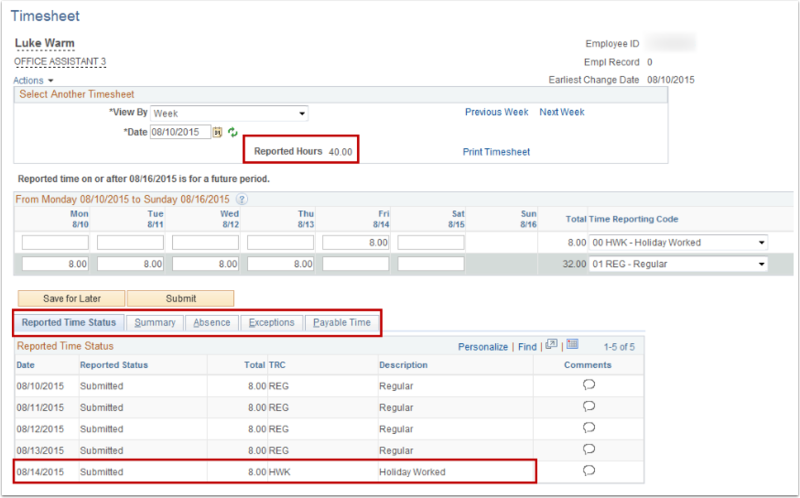 Navigate to prior or future timesheets by click the Previous Week and Next Week links. 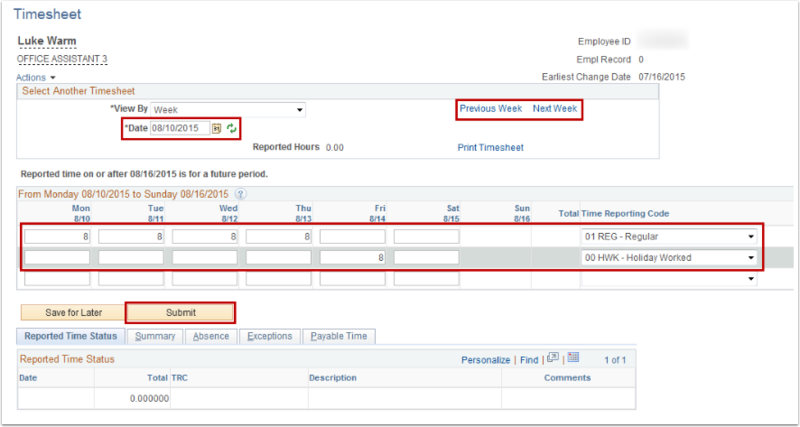 Enter the hours worked for each day in the Time Reporting section. Click the Time Reporting Code drop-down menu and select the appropriate TRC code. Use an additional line if using multiple TRC codes. Click the Add a Row (+) button to generate more lines. Note: Click the Save for Later button to calculate hours before submitting them, or to just save the time just entered. The Reported Hours field is updated with the saved time. Note: Notice the additional TRC Code is included in the Reported Time Status section. Note: When the Save for Later button is used, it generates a message box. Select Yes or No to validate time. In the In field, enter the time arrived. In the Lunch field, enter the lunch start time. In the second In field, enter lunch end time. In the Out field, enter the departure time. Note: This screenshot shows time entered in 24-hour time (military time) and 12-hour time (regular time). Click the OK button on the Message page to certify that time reported is true and accurate. Click the OK button on the Timesheet page to submit confirmation. 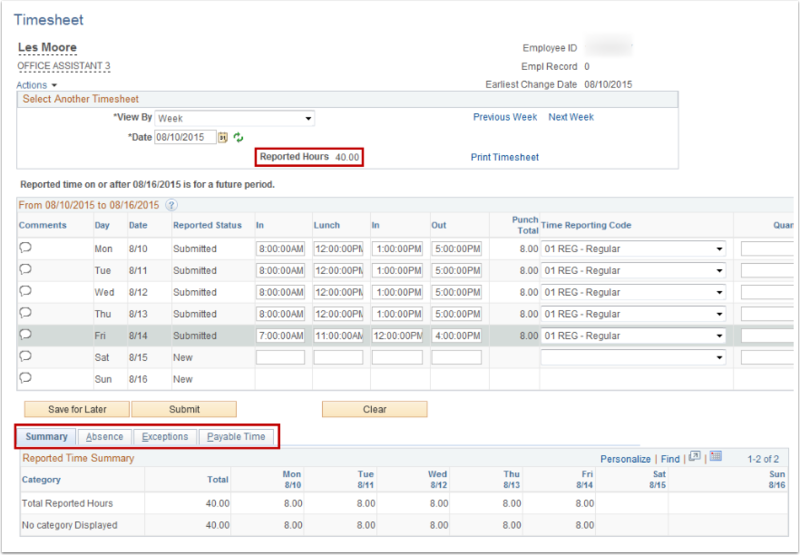 Review the Time Reported Status section for various options to view time, absences, and exceptions. 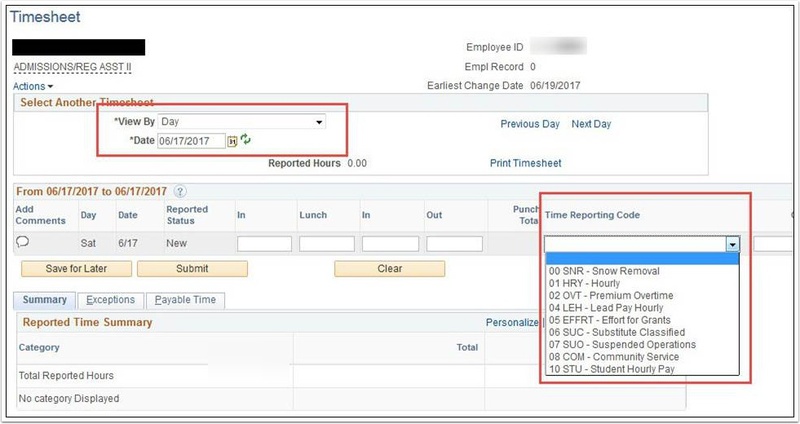 To view the appropriate time reporting code, change the View By drop-down to "Day"
Click on the View By drop down and select Day. Click on the green Refresh icon next to the date. 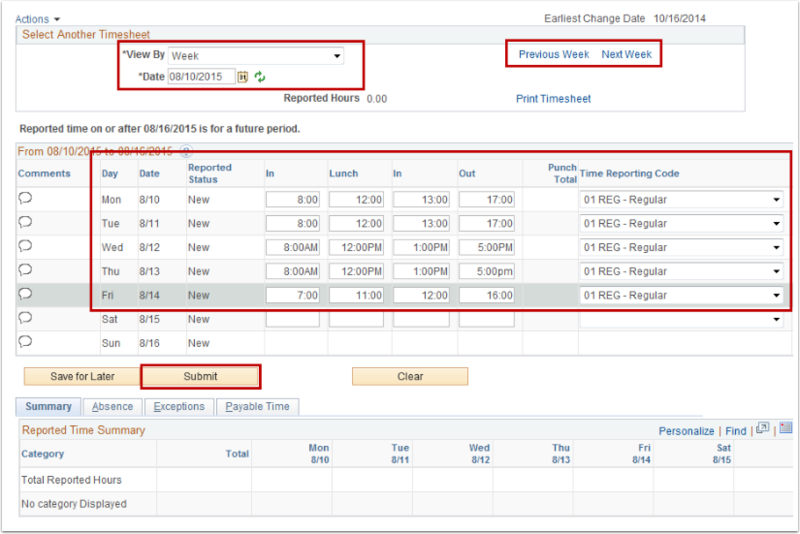 Scroll through the days and select appropriate time reporting code form the dropdown menu.